I “liked” Totally Target on FB! Following you at Totally Target on Facebook too! yippee, could not shop today or yesterday…fretting about the rebuild, so a gift card would be sweet! i hope to win it!! How cute! Pick me, pick me! I would love to win this for my daughters bday that is coming up in January! I follow you on FB and look forward to your posts every day! Thanks for saving me $$$! I sure could put that to good use ! i already like u on facebook!! I’m just learning to get the good deals at Target, and this card would get me TONS of stuff! Totally Target is great! I would love to win! Thanks for a chance to win the gift card!!! RedFeather LOVES Totally Target on facebook! yey!! you guys are awesome! I LIKE Totally Target on Facebook… As a matter of fact I LOVE Totally Target! i love target its such a great; clean store; great quality of clothing and other items. we could really use this gift card. the toys are great there also great prices. Entry #1 Love your site…. I check it everday! I already liked you on Facebook. Thanks. would love to win something!!!! I have liked totally target awoke back. 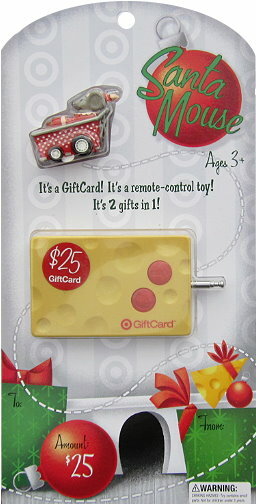 Remote Santa is too cute! I hope I win.